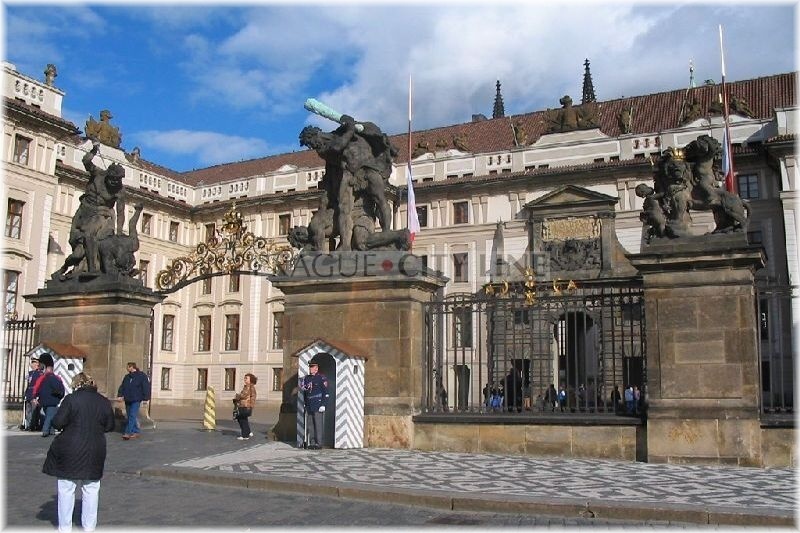 After the long passage from from the distant Royal Palace the ceremonious procession reached the premises of Prague Castle and right here we need to introduce some very significant monuments before we approach the festive royal coronation. The main entrance gate is part of the Rococo grille with the monumental pillars on its both sides which carry the statues of the fighting giants from 1768. The members of the castle guard are always standing at the pillars. We will go past them and enter the first courtyard, the scene of the welcoming political ceremonies and of the solemn changing of the castle guard. We will pass through Matyášova brána (Matthias Gate) and continue to the second courtyard which is bordered by the wings of the New Palace. 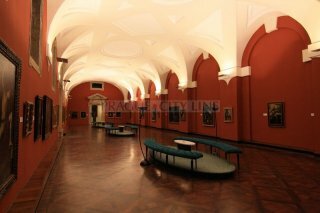 The castle picture gallery, the Spanish Hall and also Rudolph´s Gallery are to be found in the palace. Then we will move to the third and main courtyard which hides many gems of our history. St. Vitus Cathedral is certainly the main view point. Another monuments are the house of the old provostry, the granite monolith in the centre of the III.courtyard or the statue of St. George fighting the dragon. 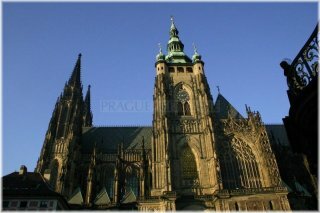 Now we will focus on the most significant landmarks of Prague Castle. 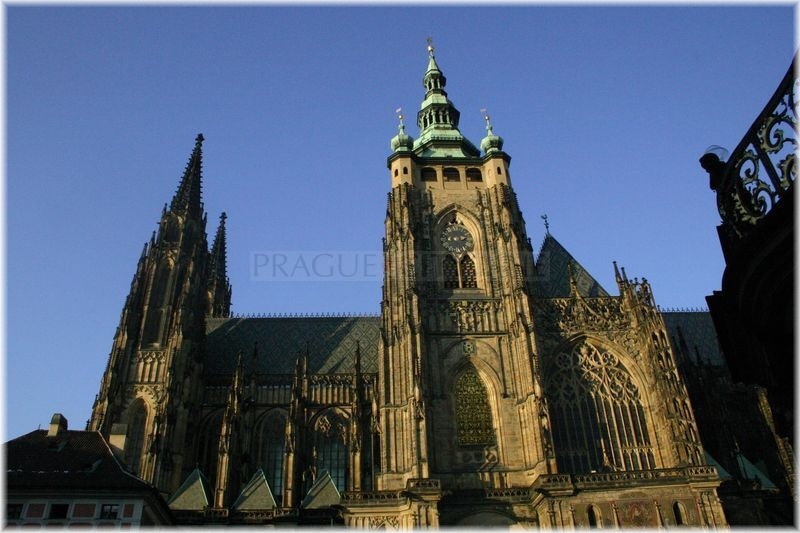 St. Vitus Cathedral is ranked among the greatest and also most significant Prague cathedrals. Among others, this sanctuary is the place where the remains of the saint patrons of the land, monarchs, nobelmen and archbishops are saved. In 925 the Bohemian prince Wenceslas I founded a Romanic rotunda here. The rotunda was rebuilt into a three-aisled basilica after 1060 which was later replaced by the present Gothic cathedral. The construction was the work of Matthias of Arras and later also of Petr Parléř who created such objects as for instance the choir with a ring of chapels, St. Wenceslas Chapel, the Golden Gate and finally also the lower part of the main tower. The construction of the cathedral was later completed in Neo-Gothic style. Now we will take a look inside the cathedral with the splendid decorations which enchant every visitor. The whole sacrarium is surrounded by a ring of adjacent Gothic chapels in which the remarkable monarchs and patrons of Czech lands are buried. However, our expedition is especially interested in St. Wenceslas Chapel. Right there you will find the door leading to the coronation chamber where the Czech coronation jewels are being saved. The origins of this palace date back to the 9th century when only a timber construction was standing there which turned into a stone Romanic palace later and consequently into the Gothic palace. It stayed empty for a long time in the 15th century. In 1483 the king Wladyslaw Jagiello returned to the palace again. 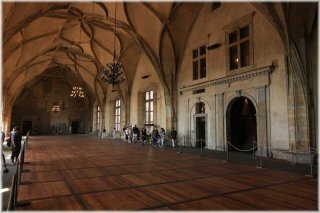 Thank to him the magnificent ceremonious Wladyslaw Hall(Czech:Vladislavský sál) was created during the reconstruction in which the coronation celebrations and feasts, jousts, markets with fancy and luxurious goods took place. During the reign of the Habsburgs the place was the scene of the coronation parties and assemblies. The palace premises were also used as conference halls, office rooms or depositiries. The Royal Palace (Czech: Královský palác) is part of the Prague Castle seightseeing tour these days. The Renaissance building with a well-preserved Romanic tower and splendid facade with sgraffitos will enchant every visitor. The object also involves the Black Tower which used to be a gate opening the Romanic fortifications and was also used as prison. Many fine art exhibitions take place in the premises of the burgrave´s residence these days. You can also visit the Museum of Toys in the north wing of the Old burgrave´s residence. Golden Lane is formed by tiny little houses with splendid coloured facades. The lane was founded in the second half of the 16th century when the castle shooters and goldbeaters settled down here. 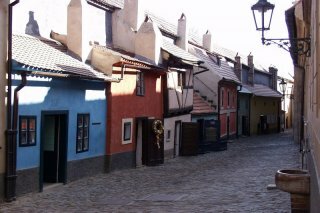 The lane was the place of the Prague´s poor people in the 18th and 19the centuries. Afterwards the lane became the harbour of many writers and artists who were looking for inspiration right in the Golden Lane. The houses were reconstructed between 1952-1955 and also the coloured facades were restored. The Golden lane is very narrow and the tiny buildings look like toy houses rather than peoples´ apartments. Rosenberg Palace and the Institute for educating aristocratic ladies. The first records concerning the origin of the houses that form the extensive building complex date the Rosenberg Palace back to 13th and 14th centuries. Part of the palace became property of the lords of the Rosenberg in 1513. In 1600 the Rosenberg Palace was acquired by the Emperor Rudolph II, who joint it with the Royal Palace. From 1753 a reconstruction of the Institute of noblewomen was in progress. The Institute was built for education of thirty noble daughters who were staying in the first two storeys of the Institute. The other premises contained the apartment of the abbess, the capitular chamber, the sacrarium, the lounge, the Baroque Holy Trinity Chapel and the Chapel of the Immaculate Conception of the Virgin Mary and the rooms for the service supply. The Institute of noblewomen was closed and consequently dissolved on May 1st, 1919. 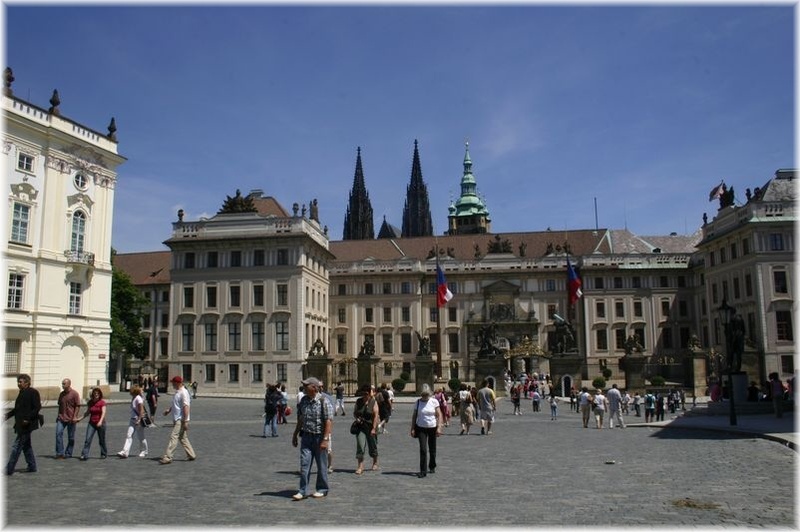 Rosenberg Palace has been opened to the public since 2010, and is now part of the Prague Castle seightseeing tour. 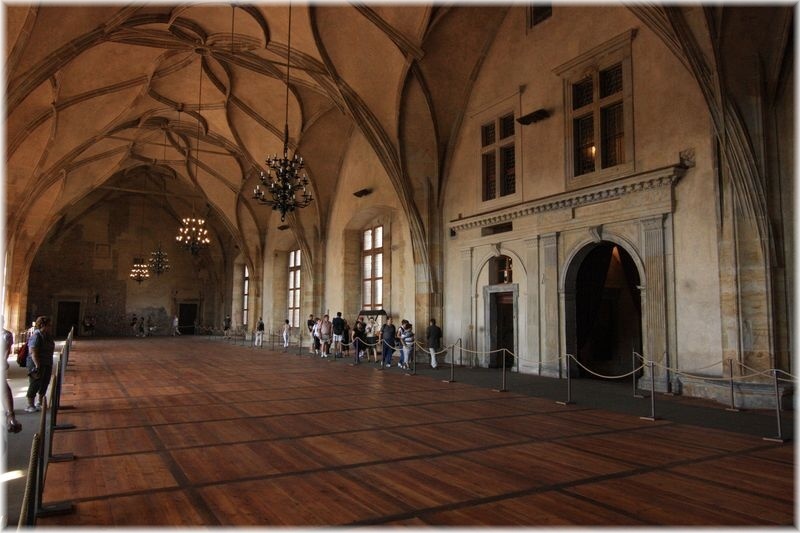 The oldest exhibits, placed in the Prague Castle Picture Gallery date back to the times of the Emperor Rudolph II. The oldest exhibit is an inventory from around 1660. By the way, the picture gallery contains a permanent exposition where you have the opportunity to view more than a hundred of the highest quality pictures. The total number of the pictures that belong to the Castle property reaches 4.000. The quality of the works in Prague Castle Picture Gallery can match the most remarkable European art collections. The Picture Gallery further contains gems that come from the workshops of very important Italian, German, Dutch, Flemish and other masters of art. After the procession reached Prague Castle in front of St. Vitus Cathedral the coronation ceremony was ready to start. 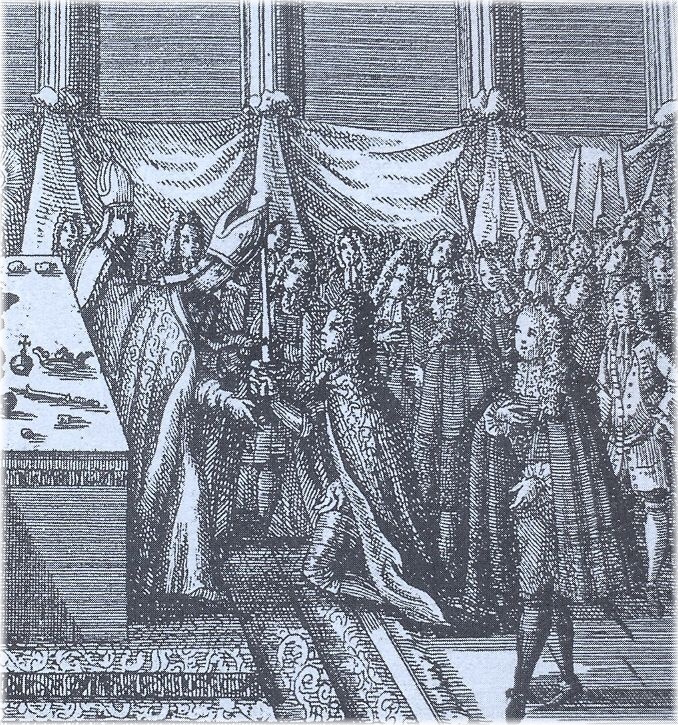 At the exit from the Chapel of St. Wenceslas the high-ranking land dignitaries with coronation jewels were lined. 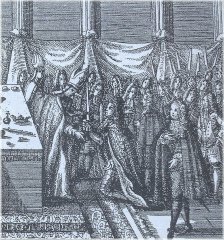 After the king entered the cathedral, the ceremonious music which was determined for the coronation act started to play and the priest began to utter the prayer. People who were in charge with the coronation jewels gradually started to bring them inside of the cathedral. The most respected guests were seated in the presbytery behind the altar. The procession with the king went on and halted right in the presbytery. Then the archbishop uttered prayers and when he finished the king sat down on the throne. Then the reading from the Old and New testaments followed. After the music stopped playing the king moved in front of the altar again where he knelt on the prepared faldstool. The new sovereign had to make two oaths afterwards. Finally the archbishop uttered the final prayer and then the new king of Bohemia festively went out into the courtyard with the sound of trumpets and drums.